Trying to get fit too fast? Everyone likes to see quick results, however there are times when the body is just not ready. 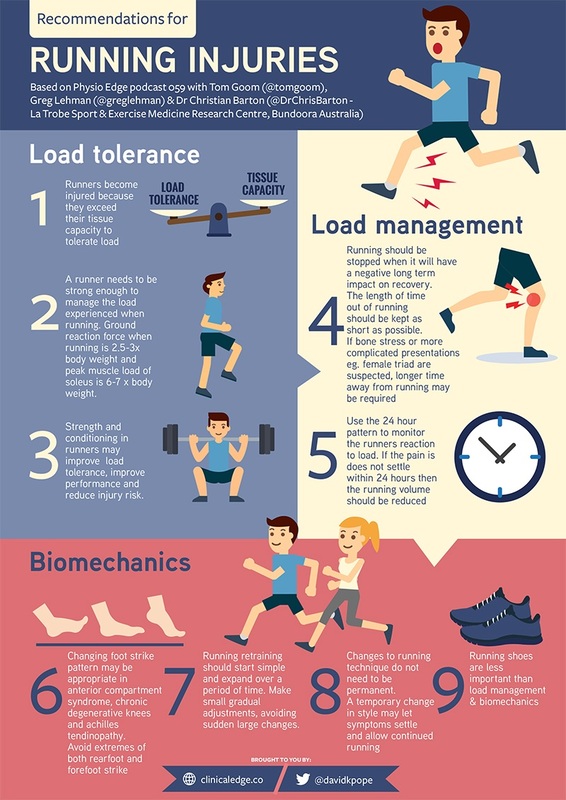 The majority of running injuries are caused by overuse, applying a repeated force over a long period of time. Another main cause of running injuries is a sudden increase in training volume when the body is not conditioned to do so. The plantar fascia is a flat band of tissue which connects your heel bone to your toes. It supports the arch of your foot. If you strain your plantar fascia, it gets weak, swollen and irritated (Inflamed). The heel or bottom of your foot can then cause pain when standing or walking. This is an overuse injury which can cause pain in the tendon which connects your calf muscle at the back of your leg to the heel bone. Pain can be felt both in the middle of the tendon and at the back of the heel bone where the tendon attaches to it. This injury is particularly common in people who have suddenly increased the intensity or duration of their runs. This running injury is often triggered when the patella fails to move smoothly and stay centrally aligned along the femoral groove at the lower end of the thigh bones. Sometimes this is due to muscle imbalance or abnormal anatomy. Correcting this issue is important before it becomes a long-term matter. It’s important to note that you don’t have to be a runner to get Runner’s Knee. 1) When starting your journey to getting fitter, train ‘Smarter not harder’. Gradually increasing your training load over a period of time will massively decrease your chances of picking up an injury as it gives your body a chance to adapt to the new training loads. Having adequate recovery time in-between exercise is vital to ensure your body fully recovers for its next session. 2) Running puts a lot stress on the body (up to 5.6 times your body weight). So having enough strength to deal with these loads is extremely important. A general strength & conditioning programme will greatly compliment your running endurance and help to prevent running injuries. 3) Footwear can play a big role in preventing running injuries. Poor foot support can impact the way your foot strikes the ground which can further affect your joints. Having runner’s with arch support and good shock absorption is important as it lessens the impact through the heel. 4) Finally, Listen to your body. If muscles are tight/sore this is them trying to communicate with you. It is important to do regular stretching to keep everything loose. Below is an info graph summarizing all the above information. If you do notice any of these injuries when running/exercising it is important to consult a health practitioner or physiotherapist. If you’d like to have a FREE, no-obligation running injury assessment as BodyFit Physiotherapy Howick or Pakuranga please call us on 09-5328942 or fill in the form on the right-hand side.